Was it it Wednesday today?? Cat arrived home at midnight so when she came down for breakfast she had 4 young folk all over her with questions and stories of what they had all been doing while she was away. It must be very annoying after a while but she is remarkably patient with them. They were just so excited to see her again. We finally got into the school room and after finishing the boring stuff we had fun because where we are in our Before Writing project meant that it lent itself to some practical fun. We were talking about the different areas of early civilisation and the tools they used to make the types of writing they did. Today it was Mesopotamia – they wrote in cuneiform using clay tablets and papyrus stalks. So while I was trying to get Mahalia’s reading lesson finished – man! some days it’s like pulling teeth with her! – Shoshannah got some clay and rolled it out into three small tablets and Nathan found some suitable small branches and trimmed them appropriately. They then had heaps of fun making patterns representing cuneiform. By the way, do you know why it is called that? Because cuneiform means wedge shaped and that is the shapes they based their written communications on. The children were playing outside most of the afternoon. At one stage later on I was on the phone sorting Anson’s tickets. Hung up and walked through to the living room to connect to the internet. Heard my cell phone going crazy, got to it too late, then went back to the study to write down the number of whoever it was that had called, as I was trying to do that there was very loud crying coming in the back door, Mahalia appeared with blood streaming down her face, then the phone started ringing again, so I got her into the bathroom, sent Shannie for a cup so she could rinse out her mouth, ran and grabbed the phone – a business call Tim had been expecting, sorted that out and got back to the bathroom to find Mahalia swilling and spitting. I managed to get out of her that she had tripped as she was running down the steps towards the back door and fell and hit her mouth. She had successfully knocked her front tooth out. It had been loose for a while so no great loss except it was rather traumatic and painful loosing it like that. He other front one is now loose too. After she had recovered from that the decided they wanted to go swimming despite the southerly blowing in here today. A warm bath and then they cuddled up in my study and watch an Australian dvd about Skippy the Bush Kangaroo. I am really enjoying introducing the children to all these ‘old’ tv programmes that I used to watch. There is something really lovely and wholesome about them and they so enjoy them. Anson had a chat with Josiah tonight – nice to catch up on how he is doing down in the big smoke of Christchurch. Doing well working for a roofing contractor so that is great. Pears & mussels & work…. I had a bit of a rough night last night. Woken twice by Shannie’s alarm and then by Tim getting up at 5am and then again at 7am by the phone. Didn’t feel that great for a while. But we got through the normal chores plus all the dinner vege preparation. Had one trauma when Shannie found that one of her roosters had been killed in Nathan’s possum trap. As Seb said ‘Poor ole Nate strikes out again’! She actually had 4 roosters so it wasn’t really too great a loss apart from the fact that it was hers and she found it dead. Nathan buried it in her allotted spot and she was ok then. Told me later that she now had 6 birds buried up there! She’s been so delighted lately because she has been getting some bantam eggs from her pullets. The eggs are so tiny. They iced them and had them for dessert tonight and everyone loved it. I managed to steer the other 3 into the school room and got Seb into his room and we managed to get through a reasonable amount. Had an interruption by a man from a boat needing to borrow a drill to fix his freezer – he donated us a packet of biscuits in exchange, nice change from wine, which we don’t drink! The children only had one swim today. This afternoon Anson took Shannie with him to help with chain-sawing up some firewood, Nathan went out on the boat with Tim, Asaf and Chen to do some mussel work. Not too sure what I did but the afternoon disappeared somewhere. After dinner we got a team to peel pears and open mussels – good jobs out of the way. Only 6 more cases of pears to go! Jesika arrived home just as we finished – she bought Miles, a wwoofer from California, with her. As the guys are all heading out to grub weeds again at 6:30am his introduction to work here will be baptism by fire-!! They all had a good laugh over a couple of Black Book episodes and then everyone was off to bed before 9:30pm and I think I will be close behind and hopefully my night won’t be so broken. Asaph was up early to go to work with the guys. I got up too thinking I would get lots done before the children woke but no such luck! They were good though, they disappeared into the attic and we had to drag them down for breakfast and chores. When I asked Azzan why he was up so early he told me that ‘my eyes opened so I got up’. Figures I spose! I had made muffins before school so when I came out to get some for morning tea I found Azzan, Chen and the kittens looking most comfortable. We are doing a project on the beginnings of writing. Today the children really enjoyed making pictograph shopping lists but when it came to doing rebus’ of their names we ended up putting it in the too hard basket. If any of you can come up with rebus for the three – Mahalia, Shoshannah & Nathan – then please let me know, we were totally stuck. Asaph was relegated to bbq-ing the venison for dinner – the kitten was ever so hopeful. Missed out on that but Nathan caught them some fish so kept their wee tummies happy. The guys have been concentrating on getting the weeds grubbed out. So any day that nothing else is happening they are gone by around 6:30am and get back in around lunch time. They are making good progress. I think giving Tim Fri morning off has helped him, he was up and rearing to go Sat morning despite the children – ( I actually hesitate to call them children despite the fact that they are our children even at the old ages of 21 & 27 – young adults sounds better) telling him they would be fine on their own. His attitude is that many hands make light work. Asaph & Chen from Israel arrived later in the afternoon. He is the brother of Ariel who was here 3 years ago. They have slotted into the craziness of the place really quickly. Asaph has a droll sense of humour and is coping well with my boys – when Anson gets going there is no stopping him, his humour is fast and cutting and our meal times tend to dissolve into a lot of noise and craziness – to which he then stands back and announces it is all the little ones creating the noise and orders them off to bed!!! I had a lovely long chat with a friend in Australia – she is having major eye problems and is having to have a major operation so it was good to catch up and brighten her day somewhat. Anson took Tim & I up to Waterfall Bay after dinner in the dinghy to inspect the tiling job in the upstairs bathroom which had been redone due to fast and sloppy workmanship. It is still not right, not too sure what we can do about it but Tim is certainly not happy and not accepting that it has been corrected satisfactorily. Anson set a net while we were there. He and Nathan pulled it up Sun morning but the catch wasn’t brilliant. The weather was great over the weekend and the water was incredibly clear. Absolutely beautiful, could see right down to the depths. We were watching a sting ray and 2 eagle rays cruising the shallows as we walked along to Jesika’s. They were beautiful. We watched ‘White Squall’ Sat night – a good movie, rather traumatic, tragic true story. Worth watching. Then when it finished and we were all heading off to bed Anson decided he needed some humour after such intensity so he put on ‘Hoodwinked’ – I managed to stay awake for most of it, but as I was falling asleep, decided to watch it another day. It is a crazy animation about Little Red Riding Hood with a twist! I have been having many calls over the past few weeks with a local friend who is applying for an exemption from state education. Because her son is a special needs case the authorities are making it as hard as possible for her. It is really distressing, as she has put her heart and soul into the application and making it all work and she has so much backing and grounding as to why she should home educate him. In fact over the past weeks since school officially began she has done far more work with him than he ever would have done if he was in a school. He is also way happier and settled. I am positive she will win the battle but it is just traumatic having to spend so much time doing battle when all she wants is to be spending time with her young lad. Please pray for her, that this week will go smoothly and that the exemption will go through without any more hassles. I also had a great catch up with two of my brothers and my s-i-l last night. Unfortunately my little bro was out so never got to catch up with him – another time. He was at a concert so hopefully he was having an enjoyable evening. No movies last night – everyone was too tired so we ended up crashing by 10pm. This morning the men were up before 6am, Asaph & Chen got really brave and got up in the dark to hang out their washing and go see what all this grubbing is about. Hope they last the distance. 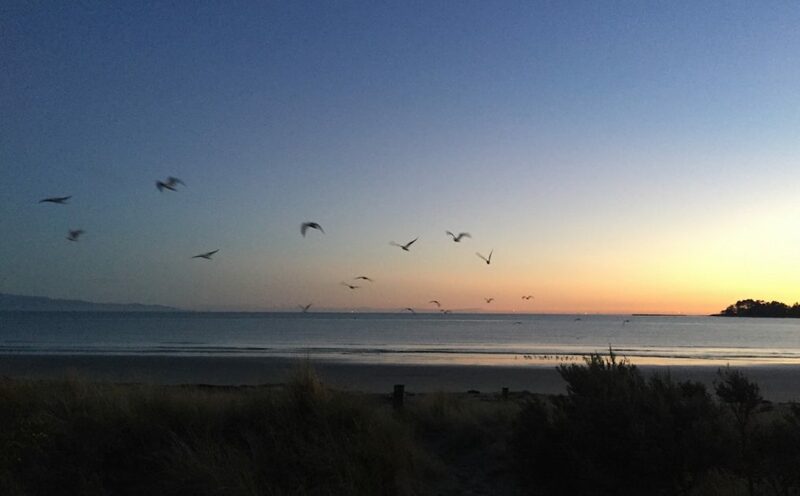 The little ones are up and making noises so I guess I should go feed them and drag Nathan outa bed – he’s not an early bird, but as he has a net to pull in before school………..
Jesika, Seb & Anson went out at 6:30am to grub weeds. Tim was able to chill out a bit this morning which was good. Slept in a bit later. I got the young ones into the school room at a good time and managed to accomplish a reasonable amount. Azzan proved to be a bit trying so Tim read him lots of stories and side tracked him. The work crew arrived back and decided we were all going out for a family fishing trip. Jesika shot home to pack some food and Anson brought the boat in. We left just before 1pm, leaving Seb behind as he wasn’t feeling great. We basically just steamed around the back of the farm – fishing as we went. It wasn’t great fishing – they lost so much gear, Tim reckons around $40-50 worth of sinkers and traces! Heaps of barracuda around taking it all. Azzan went to sleep against me so I wasn’t able to do much except read my book. Not really too much of a hardship as I am not really a fisherman and the book was very intriguing – ‘Double Helix’ by Sigmund Brouwer. It is fiction but as with a lot of fiction there is a lot of truth in it and ultimately quite scarey in the consequences of DNA and fetal experimentiation. Anson & Jesika were hard at it and ended up catching a good quota of fish to bring home for dinner. Tim and the 2 girls went off beach combing in the dinghy. Anson was in fine fettle – commenting about the boy racer charging around with the two chicks in his boat as Tim and the girls went zipping past!!! It came in cold as the southerly blew through the straits. We got home around 5pm. Seb was sleeping but he had cleaned the living area up beautifully – lovely to come home to. No-one really wanted any dinner so we all just picked a bit at the fish and chocolate brownie. We all watched a dvd – ‘Secondhand Lions’ – brilliant movie with Michael Caine. Really funny yet poignent as well. After the 3 young ones went to bed the rest of us watched ‘Happy Gilmore’ – another very funny Adam Sandler movie. I feel like we are doing a really movie cram at the moment, but we hired a heap when in town and have to send them back with Jesika on Sunday so need to get them watched. You know that pile I mentioned that was in the hall last night? Well here it is! The main question we were all asking is how on earth did Nathan fit all of that in his room? I am pleased to report it is now all sorted and packed up neatly. He and Seb have swapped rooms and both are tidy at the moment and the hall is clear. I did gasp a bit when I saw Seb’s floor this morning though. There was a mountain equitable with Mt Cook of clothes. He had basically tipped his entire pack out on the floor and it was ALL washing. I asked if maybe he could’ve done some washing while away, but his response was they didn’t have any wet days, so no time to do it! Today I have hung 6 loads of washing out all told. Thankfully it was a great drying day. At one stage I hung out 31 socks and only one sock was not Seb’s!!! I got home at midnight Tuesday so Wednesday morning I was operating on a slower speed to normal. I didn’t get to the shower very early, let’s say it was actually quite late in the morning. Not because I was in bed though – I was actually up reasonably early, just couldn’t quite get there. So, I had sorted out my clothes and put my washing in the laundry basket in the bathroom in anticipation of taking it all out to the wash house myself to sort and wash each item of my town clothes in accordance to the instructions in each garment. When I finally got to the bathroom for my shower I found the laundry basket was empty. I screamed and tore out to the wash house and found to my horror that all of my delicate very expensive clothes had been washed in the same load with the everyday kids clothes, towels and Anson’s shearing jeans etc. I was totally horrified and in a panicked state. Thankfully when I retrieved it all and hung them on the line there was no serious problems. However when I found out that my super diligent 21yr old son had been the culprit I tried explained to him about how men have to learn to sort washing and NOT do delicate $150 dresses in the same load as his shearing jeans – his response was – ‘Well they were my $100 shearing jeans’!! Men! Look what came to visit last night. Rhapsody II is 87′ and makes our 38′ boat look quite insignificant. Shannie was keen to go visit so Tim zipped her out in the dinghy after breakfast but the owner was not yet up so the crew couldn’t allow her on board. Tim & Anson went grubbing tahinau again this morning so I cracked whip and managed to get all the children into the school room and chalk it up – we actually accomplished some academia. I decided to begin Azzan on a reading programme today too, we will see how he goes, so far so good. After teaching 8 children to read and now trying to get Mahalia reading I just couldn’t face having to do it again in a year or so’s time so thought as he is a bright wee man and clicks on really fast I would try and get him started now. The tide was really high and it was so warm and clam the children all went swimming. Shannie is delighted to be able to jump off the wharf and get herself to shore now so I had to witness the event. Jesika & Anson have decided to go grubbing tomorrow and have told Tim to take some time off – he is happy and not arguing as he is really tired at the moment. Seb and Anson cooked dinner tonight. Seb made a yummy fish and coconut cream dish with instructions from Jesika, Anson made a salad and cooked rice – really hard stuff The antics in the kitchen when they are in there is rather amusing. Anson bought home the dvd Cars so he and the children are giggling away over that at the moment. Late dinner and late to bed – tomorrow may not be such an early! I have finally managed to figure out how to load this comic page. I used my bro and photos I took of him while we were visiting Perth – he is a bit of a comic himself so the word balloons contain fairly accurate wording!